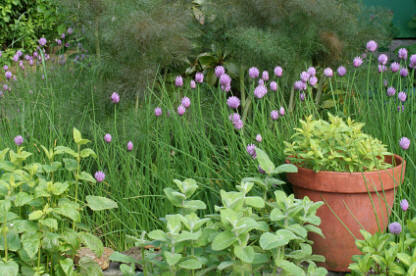 Most herb beds are informal, whether by accident or design. In fact, these are even more difficult to make effective than formal plans. Many herbs have an annoying habit of not knowing their proper limits. The books might say 90cm (3ft) high by 50cm (lift) spread—but try telling that to the plant! In your soil it may refuse to grow more than half that height while deciding to sprawl to double the spread. Or another compact, low growing variety might romp away to twice its normal dimensions, obscuring the more reticent, supposedly larger-growing plant behind it. In a small area where every inch counts, these mistakes show up badly, and there will be a continual juggling and shifting of positions until you find just how things grow in your particular site. But an informal garden can be a beautiful, blowsy muddle where finding a choice plant almost hidden by another only adds to the charm, and the sheer exuberance of plants jostling for space more than makes up for their untidiness. There is a fine line between magnificence and messincss, though, and you will need to take care that your herbs don’t escape your control. Fortunately many of them have no objection to being brought back into line by some drastic work with the secateurs before things go too far. It’s an unfortunate fact that truly beautiful informality can only be achieved by sheer good luck — unless you happen to be one of those people who have an instinct for plant associations and manage to hit the jackpot every time without knowing how they do it. For most of us, the informal garden needs a little basic planning to make it work. The points about plants are just as relevant to plantings within the formal garden.